Right in the heart of Utah’s majestic Wasatch Mountains runs the famed Provo River. The Provo River is located a short distance from Salt lake City, Utah and offers excellent fishing for large wild brown, rainbow, and cutthroat trout. It provides a variety of fishing opportunities for every angler’s desire. Dry flies, nymphs, and streamers all work wonders in this pristine Utah stream. This small but diverse river is open all year and provides excellent fishing throughout all four seasons. A beautiful water system with scenery that can rival just about any river in the world, it truly is a blue-ribbon trout stream less than an hour away from Salt Lake City. The Provo River has three distinct sections; The Lower, Middle & Upper. The Lower Provo River is the most popular section, and for good reason. Plunging down Provo Canyon this healthy section of tailwater has numerous deep, mysterious pools and nervous riffles. The nutrient-rich water promotes incredible hatches and grows fish of exceptional quality. The water flows are steady here and the river fishes exceptionally well year round. The Middle Provo River meanders through beautiful Heber valley as it makes it way from Jordanelle Reservoir and into Deer Creek Reservoir. This rich tailwater boosts great insect life, including one of Utah’s few Green Drake hatches. This peaceful river flows through quiet farm country and can be fished throughout the year. Below Jordanell Reservoir is the middle section of the Provo. This tail-water section from the reservoir to Deer Creek Lake is a wonderful piece of water which is easy to access and holds a tremendous number of quality brown trout. Browns to 20 inches are very common here and a good number of fish 20 plus inches are caught each year. There is also a good number of large rainbows and cutthroats. This section of river is surrounded by a gentle valley littered with farms and ranches. Deep dark pools and undercut banks provide shade and shelter for the trout that flourish here. Access can be gained around bridges that cross the river and at other easy access points. 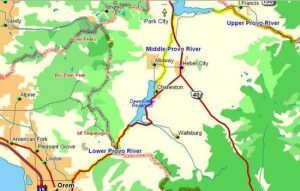 Heber City is a good starting location which is just a short distance above Deer Creek Lake. Below Deer Creek Lake is another world class stretch of river. This stretch is home to a huge population of trout. All three (brown, rainbow, and cutthroat) species flourish here with some of the browns reaching enormous sizes. Browns to 24 plus inches are caught in good numbers every year. It flows through beautiful Provo Canyon which is one of the most scenic areas of the state. Deep clear pools, classic riffles, and beautiful runs make up the water throughout the canyon before it reaches the end of its journey at Utah Lake near the town of Provo. Access throughout this stretch is very easy which provides anglers with miles of quality fishing. The Upper Provo River changes its personality immensely from the Lower & Middle Sections, as it is more of a small stream. The river starts high in the Uintah Mountains (one of the few mountain ranges that runs from east to west) and is home to a trout grand slam; brown, brook, rainbow and cutthroat trout. Techniques and mentality change to accommodate pocket water, shallow riffles and the occasional deep pool. Due to the altitude of the Upper Provo, the fishing season in this area is limited by the weather. The upper section of the Provo from its headwaters to Jordanell Reservoir is born from snow melt and runoff leaving the Uinta Mountains. This is a beautiful section of river that is characteristic of a freestone river. Riffles and runs cascade through a beautiful landscape. Good numbers of quality browns and some cutthroats are found in this part of the river. Access can be difficult here, as much of the land is posted. The river is very aquatic and offers an abundant supply of mayflies, caddis, and stoneflies as well as other insects and bait fish. The fishing at times can be outstanding with multiple hatches occurring at once. Western Green Drakes and Pale Morning Duns are two of the outstanding mayfly hatches that occur on the river. Large stoneflies and caddis are also very prolific and dependable. Big “buggy” nymphs and streamers also work extremely well when hatches are slow or at any other time. If you’re going to be in the Salt Lake City area, be sure to stop by the Provo. It is an outstanding river which has been labeled as one of the best trout rivers in the country. Although the Provo may not get the attention like many other larger rivers do, it is one not to be overlooked. If you’re going to be skiing or just visiting the area and would like to take a day fishing, the Provo is a short 30-60 minute ride from Salt Lake City. The Provo River is well worth taking a serious fishing trip too. The Green River is close by to give anglers an other fishing opportunity. Make sure to bring a camera along not only for the scenery but for that trophy fish you may catch. Many browns are holding in the shallows, but the majority of fish are still in deep holds in a river that’s running a little high. Nymph the deep holes, but make sure your flies are getting down to the bottom. Small dark midges, small BWOs, and dark sowbug patterns are all producing. It’s also the streamer season as fish are active in the spawn. A variety of streamers work as fish are getting into their more aggressive mode. Avoid fishing to active spawners and do not wade on the redds (the areas of cleared gravel that the fish lay their eggs in). The Middle Provo is at a nice flow While midges hatch sporadically all day long, fishing nymphs is the real producer. Egg patterns and small midge nymphs are the key. The color of a sucessful dropper can vary, but it has to be small (18-20). Don’t ignore the tail-out of a run, some great fish can hold there. – Scuds/Sowbugs: sizes 14-18. Orange, Rust and Pink colored patterns have been successful. Fish them deep! – Zebra Midges and Miracle Nymphs. Fishing is picking up on the Provo. Bouncing a nymph has been the most productive during the warmer hours of the day. If timed well, you might get into some top action with a spotty midge hatch occuring. This will be improving over the coming weeks. I’m looking forward to it! For now, small midge patterns, small pheasant tails and the trusty sow bug have been catching fish. Specific patterns found below. I’ve been stalking the banks, watching for fish feeding in shallow water. When I spot one, I position myself down and across from them. With little weight and some light tippet. I focus on getting a good drift right through their feeding lanes. Or, I’ll go deep with more weight after fish holding in deeper pools. Both approaches have been producing fish. Fishing is quite steady on the Provo right now and I don’t mean the nymphing. While fish can be caught on nymphs, there has been great action with dry flies. The baetis hatch is starting when the proper conditions allow, but there is a great midge hatch on most days. The midges we are seeing are the “buffalo” midge and we are fishing size 16’s to imitate them. As the midge hatch continues to taper off, the baetis hatch will become stronger and stronger. Last year, our baetis hatch was in full swing by this time, but we haven’t had the weather conditions to kick start them into consistency just yet. They are not too far off. -Some success has been had on a black wooly bugger and an olive clouser but be creative, there isn’t a specific pattern working over the others at the moment. The Lower Provo has the tendency to get dirty whenever there is a little rain due to the construction that is going on there. On the Middle Provo, about 3 to 3.5 miles down from the Jordanelle dam, they are working in the river, turning it into chocolate milk from there down. The midges are going good in the morning, especially sunny days. The Blue Wings are starting about 11:30 and are going to about 2:30 give or take. We have found that Thorax and CDC Comparaduns are doing well for the dries, as well as cripples. We have also had success dropping off midge adult #22, midge pupa #20 and a grey soft hackle #18 off of the dry about 14”. Nymphing in the morning was good with a p.t. #18, zebra and midge pupas. The lower Provo has already become the victim of spring run off. The flows have been increased in anticipation of the run off yet to hit Deer Creek reservoir. The flows have been up long enough that the fishing has definitley stabilized. The trick now it to adjust to the new holding areas where the fish can escape the heavier currents. Look for new pockets and slower bank currents. Now that the brown trout fly have hatched, streamers can be extremely effective at the higher flows. At high water it can be very dangerous to attempt crossing the Provo. It your best bet would be to cross at the trussel or another bridge, it you wish to fish from the other side of the river. It is still blue wing olive season. Be prepared with a variety of BWO patterns. Fish on the Provo tend to prefer a dry with a sparse hackle. A CDC comparadun, or thorax BWO is a good option. The middle Provo continues to run clear, and the fishing has been good. Look for the water to begin rising on the middle Provo any time now. The Uinta mountains had a great winter and reports are the snow pack is deep. This means there is a lot of water that has to go somewere. -At high water a streamer is always a good option. Wolly Buggers, Double Bunny, Clousers and other streamers in white, olive, black and brown are a good choice. Sparse baby brown trout patterns can be a killer. The Lower Provo River has flows that are slowly, but surely coming back down towards normal. Look for small stones and caddis to start appearing. The staples (scuds, sowbugs and midges) are still producing. Middle Provo has come down to 500 cfs and is fishing well. Green Drakes are on rocks but none in air yet, should be close. Pmd’s are moving around on the rocks as well but few in air. Best flies were caddis larvae green, barrs emergers, pheasant tails, and other small midge and baetis patterns. Both the middle and lower Provo rivers are fishing well. The water is up slightly on the lower Provo and it is slightly off color, but we fished it yesterday and we hooked a lot of fish. The middle Provo is low and clear. The fishing has been good, and the fish are healthy. Look for the fishing to pick up as the weather cools down. The lower Provo is still seeing high flow and the fish are looking for slower water to take a break from the current. The water can often be slightly tinted, but don’t let that turn you away. We are a little spoiled by the normal water clarity and on most rivers our “slightly stained” is considered clear. Nymphing is your best bet, but there has been some midges and bwo’s to get the fish looking up. The middle Provo has been the really champion this summer and continues to be so. Good insect activity and flows keep the fishing consistent. Look for some midges, bwo’s, pmd’s and caddis. Also, don’t put away those terrestrials yet. Cooler weather means the fishing is going to just keep getting better. Streamers are a great option this time of year. Between hatches, give a streamer a toss. The lower Provo is experiencing is late season flow, but don’t be deterred. The fish are congregated in the deeper pools and the spawning fish are working the gravel bars. Fishing can be good with nymphs and streamers. Some very sporadic dry fly activity, mostly midges and small BWO’s. The middle Provo is running at a good flow, not too low, but not high either. Fishing pressure can be higher up on the middle than down on the lower. Don’t be afraid to walk a little to get away from the crowds, it will pay off. Same game plan here as down below, but you are likely to find a little more dry fly activity on the Middle at certain times. Streamers are a great option this time of year. The morning air was crisp in my lungs. No one in sight. The weather report called for blue skies and temperatures slightly warmer than average. A midge landed on my hand as I fit the ferrules together on my fly rod. A quick glance at the stream made my heart skip a beat. There were fish rising, big fish. I counted five rises in just a few seconds. I couldn’t get my waders on fast enough. “Slow down,” I cautioned myself as I crept down the bank. Adrenaline was coursing through my veins as I watched two large bruisers eating midges. “What size of fly are they eating?” A small fly, size 22 midge adult, black, floated past on the surface of the water. I pulled out a matching pattern from my fly box, and tied it to my 6x, 3lb leader. Anticipation was killing me as I heard the familiar sound of a trout sucking a small dry from the surface of the water. After one agonizing minute, the fly was attached to tippet. I paused to take in my surroundings, my breathing slowed momentarily. The sun peeking through the trees made a beautiful design of shadows on the river bottom. I began to cast my delicate fly, hoping to fool a brute, a winter trout. Winter fly fishing is a sport unto itself. Many anglers fish only two or three seasons out of the year. But, there are Four Seasons. In my opinion, winter is the best of the four. The fly fishing opportunities are great. Casting a big green drake dry to fish rising everywhere and hooking up to 40 is awesome fun in June. Conditions are perfect most of the time in the summer. But, hooking up to a big brown on a size 22 or smaller fly, sight fishing, slowing stalking your favorite run, and landing a fish on 3lb test tippets, that’s a challenge. It is what we practice all summer long for. When you catch four or five fish in the middle of winter, that is really something to brag about. The more adverse weather that we encounter in winter makes fishing more interesting. It is colder fishing, period. If you dress properly, however, you will stay warm and have a great day, regardless of how the fish catching was. Stocking caps, fleece pants and jackets (windproof are the best), long underwear, thicker socks and good fleece or wool gloves are needed. I also like to carry one time use pocket hand warmers. There is one reason people don’t fly fish as often in the winter, the cold. If you layer your clothes and stay dry, you will stay warm. Your fly rod and fly reel need to be able to handle lightweight tippets (leaders). The better rods to use in winter are often referred to as Midge rods. The have lighter actions and are usually 4 weights or 3 weights, although a 5 weight will work. A reel needs to have a good, smooth drag system. If you hook a big fish and have a reel that does not operate well in the cold, you will lose the fish. Sealed disc or conical drags are the best, hands down. A great outfit would be a G-Loomis Steamdance GLX 8’6″ #4 with a 1.5 Lamson Lightspeed. They balance well and won’t break the finest of leaders. Breathable waders are a must. They breathe off bodily moisture and help to keep your skin dry. The also fit more like a pair of ski pants. They allow for more layers, without constriction of blood flow. You will stay warmer in a good pair of breathable waders than any other wader type. Match it with a good, breathable wading jacket or windproof fleece jacket for the best outer layer possible. Felt sole shoes will still provide the best traction in the river, but they do pick up snow when they are wet. Gloves can make or break your day. I have tried tons of gloves. The very best out there are made by Glacier Glove. They make a glove that is primarily windproof fleece but has a thin, fleece-lined, neoprene palm. The finger-tips on your pointer finger and thumb fold back so you can tie knots. They keep my hands at a comfortable temperature all day if I keep them dry. Wool gloves are a great alternative to the more expensive fleece. I recommend fingerless without a flip over mitten. The fly line will constantly get trapped behind the flip mitten and annoy you to death. Whatever you glove choice, make sure to keep them dry. Take off your gloves before handling fish. Slip them in your pocket or just inside your waders. Your hands will be cold for a minute or two afterwards but when you slip them back into your warm, dry gloves you will thank me. Fly choice is going to be easy. A local fly shop can tell you when the hatches are happening. It will be midges from December until mid-March. Midges are small, #18-#24 are common. Make sure to be prepared to throw a nymph or two as well when there is no hatch. The dries will only last an hour or so each day. Make sure you have all different colors and sizes, too. These fish can be very picky in winter. Make a slow, calculated approach to every potential spot. If you spook a run, they may not eat again for 10 minutes. Take your time and watch the run for subtle indications of how the fish are feeding. They may be breaking the surface but are they eating emergering insects or adults? The sun has finally met the Western Horizon. I am tired, sore shouldered, a little colder, and the time has run out of the day. I am also content. I fooled seven nice brown trout and one hard fighting rainbow. I caught fish on dries, nymphs and emergers. I lost one big brown, fourth cast of the day. A glance around reveals the trail back to the truck. I am reluctant to leave, but eager to come back, soon. Four Seasons Fly Fishers is located in Heber and offers guide service and supplies. Their guides are on the water every day and so they have up to date info on hatches and conditions. They are always willing to share info: 435-657-2010.